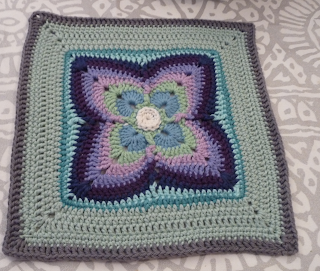 This square is no longer free, which is why *Kio made it, since I started crocheting just by looking at the walkthrough I didn't notice it until I was almost finished. I Love this square, I am planning to make a dozen as potholders since they seem perfect for that and so I will buy the pattern later. I don't know how the pattern is written, but the walkthrough makes it look very simple and enjoyable. I love the purples here with the soft green. 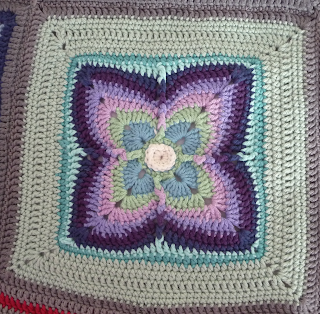 I made mine with a sort of gradual colour progression makes the square pop. As always 21x21 cm, ca 30 grams and four hours of fun. And I didn't even have to frog anything. I think the Firenze square looks like a butterfly.